Turns out we humans have been in the extinction business for a long time. Being big was just as successful as being small, and had some advantages when it came to surviving big predators. "Taken as a whole, over 65 million years, being large did not increase mammals' extinction risk. But it did when humans were involved," Smith found. Looking back over the most recent 125,000 years of the fossil record, Smith found that when humans arrived someplace, the rate of extinction for big mammals rose. She says it basically came down to hunger. "Certainly humans exploit large game," she says, "probably because they are tasty"--and because a bigger animal makes for a bigger meal. But humans did other things besides hunting that hastened the disappearance of big mammals. They burned forests and grasslands that big mammals used. They competed with the big carnivores for game. They brought dogs with them that made them better hunters. We still have lots of furry little mammals on the planet. But the pattern is clear: 11,000 years ago, the average mass of a non-human mammal in North America was about 200 pounds. Now it's about 15 pounds. And the researchers say they're getting even smaller. Populations of all three of these shorebirds are crashing. Since 1974, pectoral sandpipers have declined by more than 50 percent, and Hudsonian godwits have declined by more than 70 percent. The bar-tailed godwit may have lost half its global population within just the past few decades. Shorebird populations are declining worldwide. A rare bit of good news. However it is concerning that truly heroic efforts have only managed to get the population up to 103. This is disturbing.The article mentions that we are at the start of the Sixth Mass Extinction Event. The world’s 7.6 billion people represent just 0.01% of all living things, according to the study. Yet since the dawn of civilisation, humanity has caused the loss of 83% of all wild mammals and half of plants, while livestock kept by humans abounds. The new work is the first comprehensive estimate of the weight of every class of living creature and overturns some long-held assumptions. Bacteria are indeed a major life form – 13% of everything – but plants overshadow everything, representing 82% of all living matter. All other creatures, from insects to fungi, to fish and animals, make up just 5% of the world’s biomass. The new work reveals that farmed poultry today makes up 70% of all birds on the planet, with just 30% being wild. The picture is even more stark for mammals – 60% of all mammals on Earth are livestock, mostly cattle and pigs, 36% are human and just 4% are wild animals. The destruction of wild habitat for farming, logging and development has resulted in the start of what many scientists consider the sixth mass extinction of life to occur in the Earth’s four billion year history. About half the Earth’s animals are thought to have been lost in the last 50 years. This is measured in terms of biomass? The most frequent life is also the smallest life. E O Wilson’s observation about nematodes always impressed me: if everything else about the Earth vanished, you could still see the ghost of the continents in the nematodes. It would be interesting to see the same ratios in numbers of species and in numbers of individuals. The latter would require many zeroes for humans. 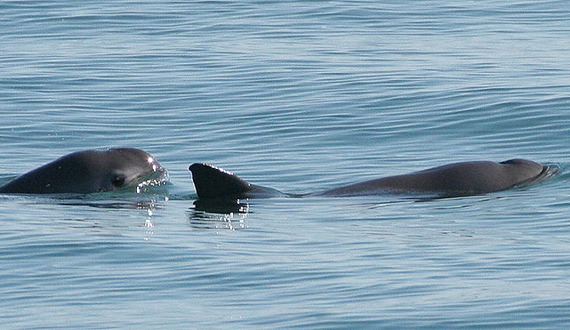 There may be as few as 15 vaquitas left. In May 2017, with the vaquita population having declined by 90 percent over the last five years, the Center and allies petitioned the U.S. National Marine Fisheries Service to ban imports of seafood caught with gillnets in Mexico's Upper Gulf of California, in order to save the porpoise from looming extinction. The pressure is on both the United States and Mexico to heed the call to save the vaquita before this tiny cetacean disappears forever. With all the ugly Trump news, I am now looking forward to the Mass Extinction Event. After all the Earth is just a minor planet, and humans have managed to engineer their own extinction so maybe they are not the fittest to survive. I just sit on my porch, waiting for the Four Horseman to gallop down my street. The colony of 500,000 breeding pairs, long considered the largest of king penguins in the world, lived on the Île aux Cochons (or, less elegantly, Pig Island), a French territory in the Crozet archipelago in the southern Indian Ocean between South Africa and Antarctica. But the penguins haven’t been counted in person since 1982 when researchers last visited. In late 2016, researchers flew over it by helicopter and saw noticeably fewer penguins than expected. Since then, by closely examining three decades of satellite images, researchers have concluded that there are just 60,000 breeding pairs left on the island. King penguins are second-largest in size after emperor penguins. They don’t nest, but lay one egg and parents take turns incubating the egg with an abdominal layer called a brood patch for two months. King penguins leave their young and swim south to forage for fish and squid in the waters of the Antarctic polar front, where cold, deep water mixes with more temperate seas. If they can’t reach this polar front and can’t swim back within about a week, their chicks will starve to death. There are only 75 of these orcas left. Not enough salmon. Too many dams divert too much fresh water to farmers. Trump. Washington's last chance to save the endangered orcas – but is it too late? Deafened by sonar and boat noise, they hunt for fish that are too few in number. With each Chinook salmon they catch, they poison themselves a bit more; pollution in the Pacific accumulates at the top of the food pyramid. And their calves are dying. Three years have passed since an orca calf born in the region survived. In the past 20 years, 40 orcas have been born into the group while 72 have died. If enough salmon can be hatched and grown fat, if enough boats can be quieted, if the water and land can be cleansed, Seattle’s orcas might just survive. That is the hope. The fear is that this final opportunity to save the orcas will be blown. Or worse,that the opportunity has already passed. Evidently the extinction will kill off the humans early, and once the humans are gone there's a distinct possibility that the the earth will cool, the air and water will clear, and in a century or two things will be back to normal, absent the most dangerous and destructive species. No thanks, I'm planning to evolve some more. The group's most recent count, over Thanksgiving weekend, recorded less than 30,000 butterflies — an 86-percent decline since 2017 alone. Researchers with the group called the number "disturbingly low" and potentially "catastrophic," in a statement. The population of western monarchs in California was already low before the most recent count, having declined by an estimated 97 percent since the 1980s. The species will likely go extinct in the next few decades if nothing is done to save them, a 2017 study by Washington State University researchers found. Totoaba (a large drum fish) and vaquitas (small porpoises) live only in the Gulf of California. Both are critically endangered. 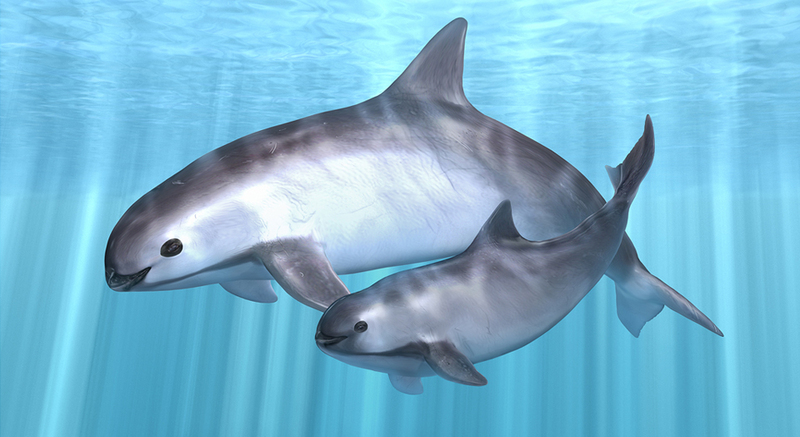 In 1997 there were about 600 vaquitas. Now there are fewer than 20 left. What happened? Soup. Fish bladder soup is a delicacy in Asia. Several years ago when the yellow croaker fish which supplied bladders for soup began to die off bladders from totaba became a hot item. A single bladder can fetch $10,000. This caused illegal gill net fishing in the Gulf of California. Vaquitas get caught in the nets and drown. Totoaba bladders are smuggled into the USA from where they are shipped to Asia. In the last year 800 illegal gill nets were removed from the Gulf. But despite the efforts of the police and the Mexican Navy illegal fishing continues. I think I see a pattern. Another surprise is that the teeming life revealed in the oceans by the recent BBC television series Blue Planet II turns out to represent just 1% of all biomass. The vast majority of life is land-based and a large chunk – an eighth – is bacteria buried deep below the surface. Houseflies and cockroaches will thrive as bees, butterflies and beetles decline, says a new analysis. We will have to train house flies to pollinate and cockroaches to eat dung. Climate change is now officially sending animals to extinction. The Bramble Cay melomys, a rodent found on a tiny island off Australia's far north coast and the only mammal native to the Great Barrier Reef, was added this week to a list of animals declared extinct by the Australian government. According to scientists, the mammal extinction is the first of its kind to be caused by human-induced climate change. Australia's Minister for the Environment Melissa Price quietly declared the extinction in a note on threatened species released by her office on Monday and reported in the Sydney Morning Herald. It was included in a listing of species at the bottom of the note, with the Department of the Environment and Energy recommending it for "transfer from the Endangered Category to the Extinct Category." I read numerous posts in this thread to catch up. How depressing. A controversial measure to dump more than 1 million tons of dredge spoil within the boundaries of the Great Barrier Reef marine park has reportedly been approved by authorities in Australia. Environmentalists worry the move could potentially disrupt one the most fragile ecosystems in the world. According to The Guardian, the Great Barrier Reef Marine Park Authority (GBRMPA) granted conditional approval late last month for the North Queensland Bulk Ports Corporation, which is a leading port authority that is responsible for facilities at the several of Australia's working ports, to continue to dump maintenance dredge spoil within the boundaries of the marine park. Successive ocean heat waves are not only damaging Australia's Great Barrier Reef, they are compromising its ability to recover, raising the risk of "widespread ecological collapse," a new study has found. The 2,300-kilometer-long (1,500 mile) reef has endured multiple large-scale "bleaching" events caused by above-average water temperatures in the last two decades, including back-to-back occurrences in 2016 and 2017. The new study, released Wednesday in the journal Nature, examined the number of adult corals which survived these two events and how many new corals they created to replenish the reef in 2018. Scientists working on the study found the loss in adult corals caused a "crash in coral replenishment" on the reef, as heat stresses brought about by warming ocean temperatures impacted the ability of coral to heal. Between a quarter and a third of all marine species have some part of their life cycle in coral reefs. Lose the coral reefs and a quarter to a third of all marine species become extinct. I heard that only two species will survive the mass extinction: cockroaches and trial lawyers. And the cockroaches aren't happy about that.